President Obama urged Congress to take action to avoid sequester cuts with a short term budget fix at the White House on February 5, 2013. Photo by Alex Wong/Getty Images. The next set of automatic budget cuts in the ongoing fiscal tug-of-war between the White House and Congressional Republicans — the so-called sequester — will take effect March 1 unless another deal to avert the sudden, steep reductions in government spending is reached. The sequester, agreed to long ago by the White House and Republicans even as they hoped it never would take effect, requires $85 billion in spending cuts over seven months. That means cutting defense spending by 13 percent and myriad other federal programs — including medical research and law enforcement — by 9 percent, said White House budget officials Friday afternoon. 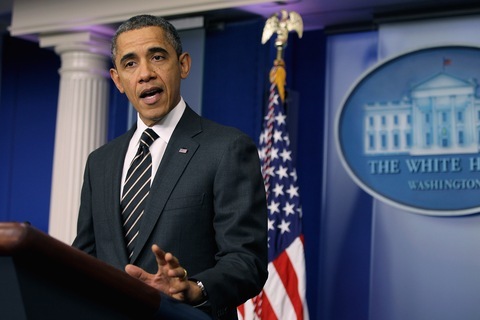 The president wants any agreement that avoids the sequester to include tax increases. Republicans, however, say no more on raising taxes, after agreeing to the so-called “fiscal cliff” settlement at the New Year on a $600 billion, 10-year hike in the top income tax rate paid by high earners. They say the total $85 billion required by the sequester can be found in defense and other programs. As those opposing views set in this week, the President suggested another temporary agreement combining tax changes and spending cuts that would keep deep cuts from taking effect a little while longer. Mr. Obama still holds out hope for achieving a deficit reduction agreement with Congress of about $1.2 trillion, which would settle major fiscal issues for years. If past is precedent, any agreement on the sequester is likely to happen much closer to March 1 than it is this week. One way out may be for the House and Senate to pass budgets that encompass a deal on taxes and spending for the rest of the fiscal year. Even if finishing that process goes a little past March 1, federal agencies could adjust, experts say. With almost daily reports that the sudden, sharp reductions in federal spending required by sequestration would harm the economy, both political parties acknowledge incentive to avoid it. In a statement Friday afternoon, the Senate’s Republican leader, Mitch McConnell, repeated that his party wants spending reductions to comprise the bulk of any deficit cutting plan. But he also said the plan should include “reforms,” leaving the door open as he has in the past to supporting tax reforms to bring in revenue.